throws up a lot of questions. So many. It also leaves me silent for extended periods of time. I am alone in a crowd. Alone in company. And I know that no matter what we are always alone. Until we have found that oneness with the universe. Found our rhythm in the cosmic dance. And then perhaps peace prevails. I wonder why we take the decisions we do, love the way we do, dislike the way we do, hate the way we do, practise the religions we do or simply live the way we do. The hows and whys and more on the why nots. The past few days I have been wondering if our forefathers fought for India's freedom only to see the country the way it is today. Most of them would be tired of turning in their graves now. I remember seeing the paper and feeling sick in my heart a few days ago and almost a pall of gloom descended. Yeah, it might sound dramatic. But that's what I am. And then there are times when I go into this phase of indifference. Nevertheless, reading up on the Upanishads, Vedas and the Vedanta philosophies and Buddhism is making me want to be free. Free of all attachment. Its started up a lot of interesting conversations on faiths and religions, customs and practices of Ancient India and how its evolved over time, with mom. Though I knew this has been her favorite and most important subject for research for decades and she has written so many volumes perhaps by now, which I wish to get published soon, I have never been able to speak to her on this. I have heard her speak to others about it though. Its quite an interesting time that I am going through, of knowing me and what I am made of. I remember this line from an interview with Keira Knightley or perhaps it was Scarlett Johansson, but I remember that like only too well. That it is imperative to know oneself and what one is made of. And I am questioning a lot of my belief systems and the basis for it. And someday I ll know true freedom. That is my ultimate goal. very well written..somewhere in all of us we need a teacher or guide todirect ..in these ..and what and what nots!! Well, soul searching at wee hours..Interesting !! And although my small brain cant understand spiritual stuff somehow I always get a feeling that therez more to it than wat u write here.. :) Only U know better !!! ..and as you always say - Tathastu! How beautiful and fortunate that you and your mother have found each other in this cosmic chaos...or should I say...planned cosmic chaos? Who says the concept of soul mates applies only to romantic relationships? Anonymous: That has been the way of the centuries and it is worth it being chained to this goal. surprising to know even a celebrity like u have the common feelings of a less known person. :) nice one there.. u know.. a life is never complete if one does nt of feel like quitting everything at one point or the other in one's life! that's the beauty it.. caged, we were, inside an unknown womb- wanting to get out n free ourselves. We get out bt incapable of doing a thing on our own- chained again by this inability, we are chained by this need to have be with people who u think are better capable than u.. yet again, u try to come out- n u do- u get a job.. money.. n are u free? chained again, by a need to have sme one to share it all with u.. u get them- bt nw u hav a family.. n u get chained by their need for u! this could never cease..
freedom cannot be achieved, even if u r let out in open- with all the greens and blues in the world welcoming u to join them.. freedom is in ones mind.. i assure u- my freedom lies in a closed space- with a small opening; water from the taps around and from the shower, singing along with me..
u are just living.. :) nothing to worry about tht! It is one of the great post I read in this blog yes it is indeed great to know oneself about his/her freedom they way we define after questioning of our faiths, belief etc. In other words, it is the real education for anyone who is willing to live with the freedom that we found after questioning. I have been reading your blog posts for a while. 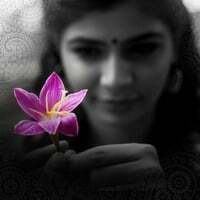 I admire you chinmayi (akka) your strong, positive and always willing mind. You are somehow turning into a role model. This chase has been on since long.No matter what you do, whatever path you take, whatever pursuit you indulge in, if the spiritual restlessness is sparked off, it keeps burning.But then there is a sense of irony too.To be free from all attachments is a want and being attached to that want negates the very purpose of it.It is a deadlock.I havent yet found a spiritual master/theory/religion/theology/practice that could untie me with this deadlock. But you are lucky,you can express it through your musical pursuit. Nicely written, you should start asking your mom to blog her thoughts if not publishing. BTW good luck in your search for Nirvana. Chins, you sound WAY beyond your age, and there is a certain involuntary falseness that peeps through..and I am saying this in a nice way :) Almost as though you want to sound as wise as your mom or generally sound like an ultra philosophical person in the early stages of attaining Mukthi! (Dear God!...pun intended :) I do not believe that what you potray yourself through the blog is true to what you really are, period. I am about 10 years older than you are, and can relate to that everything-inside-you-waiting-to-explode feeling, a sort of restless feeling bordering on "is it depression? ", that trait of bonding with adults almost as though you are one of them... But at the end of it, I'd say take a deep breath and let out the stress. Indulge in a lot of things but dont go into analysis paralysis mode. Because that sets starts setting up expectations rocket high, and often lead to dissappointment if a person/ situation/ relationship doesnt work out the way believe it should. Even with your mom, it should be more of a friend at this point and not that clawing ultra-I-surrender-to-you every minute relationship disclosure every second and Im-bordering-on-being-guilty-for-attaining-this-much-fame, while you deserved that and more at my age feeling! I think you should enjoy the fruits of your practice, blessings of loved ones and the well deserved success and yet being such a grounded person. Youth and the vibrant 20s, Zindabad! If any of the above offends, I seriously didnt mean that. i remember the great Kannadasan's words"
all i believe is to live by not annoying others. right? Shwetha: Mostly because I have been in the company of people who are at least 20-40 years older than me at any given point in time right from early childhood. I ll also add here that the books I read when I was between 12-15 years of age were those by Paramahamsa Yogananda, and Swami Rama. I almost know the Autobiography of a Yogi and Mejda by heart now. What I am writing of is something that I have seen most classical musicians speak of, some of them are teenagers. Philosophy is something that we sing about. Our Gurus teach us what we are singing about. A lot of things and the real meaning is revealed immediately or sometimes later. I can assure you this one thing, I could be in-the-face frank, maybe learn to somersault someday, learn fire throwing or something, but the one thing I can never be is false. Our natural, involuntary expression is always honesty. Falseness is voluntary. When did I ever say that what I portray in this blog is all that I am? How can a blog really be an expression of ALL that a person is and can be? My blog is a log of what goes through my mind at random times. Also your idea of my relationship with my mom is also way off mark. I dont understand that "I am guilty for attaining....." whatever. Neither was that thought ever in our equation. I don't take offense mostly, I only offer my opinion which people think is becos I have done so. Nevertheless, youth and vibrancy is not something that is only of the 20s. I intend to have it my entire life. 20s or 30s or the 67s, it cannot be the yardstick of my feeling young or vibrant. Awesome response, I especially loved the closing comments..very sincere and from the heart. Here is to happiness, age no bar! The fact that I got the relationship with your mom part wrong, I apologize for it. I probably have no business commenting on something that only you and she have the pleasure of sharing. Frantically trying to listen and learn Kamalaamba Bhajare (Ananda Bhairavi - what a raga...sigh, Dikshitar rocks!) to be all readied for my music class tomorrow. All while trying to work on a distractingly wintry California morning outside my window! I've been reading your blog for quite some time and I have been very interested in this blog of yours because of your spiritual interests :) You see, I too am going through the same phases you are going through. I too have started asking questions about my beliefs, and about the nature of God as per the Vedas. This is quite an interesting blog post. I really do love it. I wish to read the books written by your mother. It will be a pleasure indeed! When are you going to publish it? And when you do, please let us know in your blog how we can get it :) I pray to Ishwara that all His grace is showered upon you as you pursue this path of knowing the Self. Singing, reading and blogging ... well you are an all rounder! I very thoughtful write up. So true with me reading does act as a catalyst for the curious mind. It is a wonderful bliss to experience if it does manage to silence the reader. Your thoughts on our freedom also made me wonder and question. What my perception is below. Please do not get me wrong. Our forefathers fought for country's freedom, just parallel to us wanting to do what wish to do, act according to our free will. Sometimes what we might do may not be the best thing, but still we would be happy with acting according to our own will. I am not sure if I understood free from all atachments right. What would be the state when you free yourself from all attachments? I believe, there needs to be atleast one attachment, the goal which justify our ideals and our action. Is it really possible to lead a meaningful life without any attachments?? If yes, then what would give the meaning to it? Will that be true freedom?? Again, I need to thank you for making me think in this direction.